The design of window openings in buildings being erected is, as is well known, an indispensable component of the construction work carried out during the construction of residential buildings. When preparing the opening under the windows, it is assumed that the operational reliability of the entire structure under construction as a whole depends on the quality of its execution. 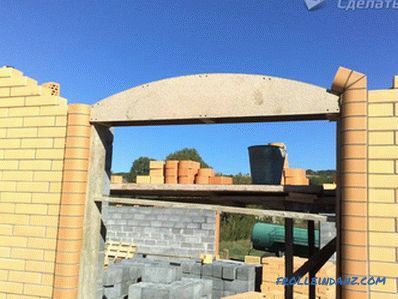 Particularly noteworthy are the cases when the laying of a window opening from a brick is carried out in the order of completion of load-bearing walls, which can only be partially dismantled after a whole complex of preparatory measures. 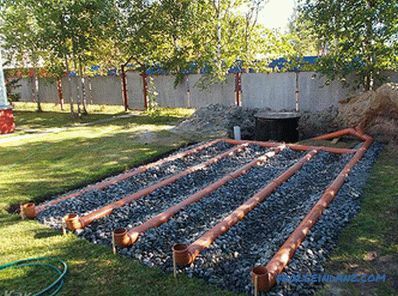 The material of the runs (jumpers) is selected taking into account the expected loads on this part of the design, as well as for convenience of working with them. 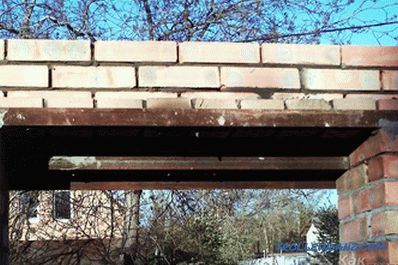 When choosing their linear dimensions, one should proceed from the requirements of SNiP defining the amount of masonry overlap within 150–200 mm on each side. Therefore, with a window opening 1200 mm wide, you will need to prepare or buy a girder with a length of about 1500-1600 mm. One of the most common types of lintels, through which window openings in masonry are made, are metal channels (corners) of the appropriate size. 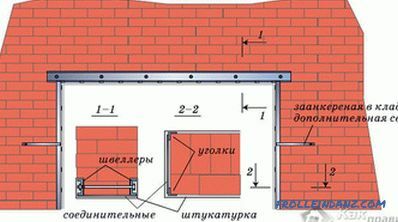 When laying the walls in a half-brick, the most convenient channel size is 120 (140) mm, and with full brick walls, the size of 240 (270) mm is best. When using a metal corner as a jumper, you may encounter certain restrictions on its dimensions related to the load capacity of the structure. 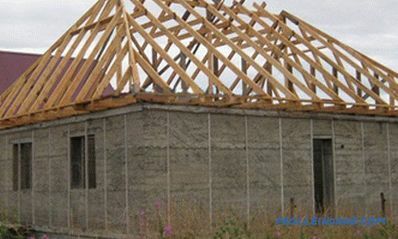 Even quite strong corners with frame sizes of 100 * 100 mm (100 * 75 mm) can be used only in cases where the laying above the window opening and the laying of the walls are reliably interconnected, and the length of the girder itself is small. In the process of installation, the corner must be positioned so that its two sides have contact with the material being laid on top of it. The length of the jumper from the corner can not be more than 1.5 meters, since the passage of a larger size can bend, and laying above it can sag. the manufacture of self-made jumpers, poured at the place of their installation. In the case of using the finished product, simply close the opening in the wall with the help of it, and then continue laying the wall along its entire length. 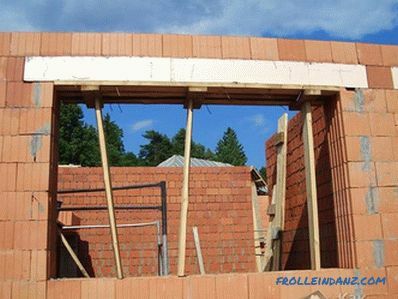 Unfortunately, it is not always possible to acquire a ready-made concrete lintel of the desired size, what happens most often with non-standard window dimensions. On the other hand, the weight of the finished web often exceeds 100 kg; so without the involvement of special lifting equipment you are unlikely to be able to raise it to the desired height. Most performers who do not want to get involved in renting lifting equipment prefer jumpers made in-house by the finished product. at the final stage of work at the location of the lintel, formwork is mounted. 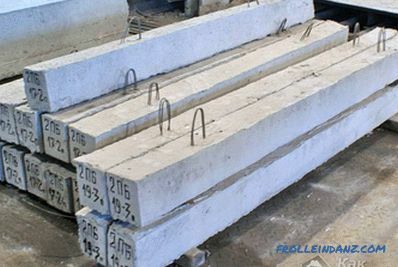 Taking into account the significant weight of the cast billet as the "bottom "formwork usually used sufficiently durable boards with a thickness of at least 20 mm. For their reliable fixation in the aperture, it is recommended to use special props based on the lower cut of the window aperture. 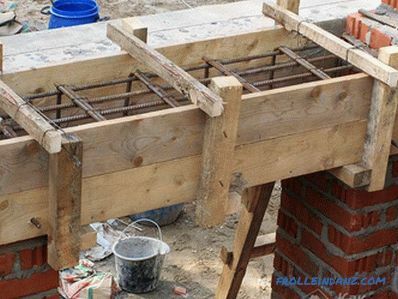 After these procedures are completed, a thin layer of pre-prepared concrete is poured into the formwork after which the reinforcing mesh is immediately put in there.After that, you can continue to fill the lintel followed by placing another reinforcing tab in the thickness of the concrete. When dismantling the formwork should be aware that dismantling its lower part is not always possible. 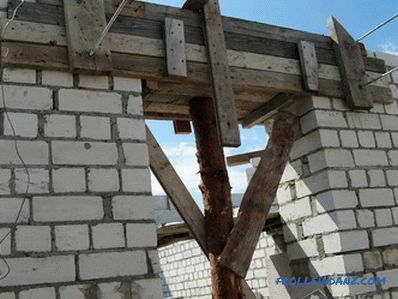 In the process of self-filling the lintel, you must carefully monitor so that the concrete solution does not penetrate through the formwork boards and that the supports of the structure do not bend. At the slightest deformation of its lower part, it is necessary to stop pouring and start it again only after “setting” the already filled layer. 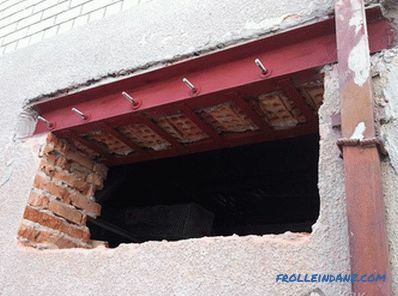 When making window openings lined with facing brick (the so-called facing masonry) in order to preserve its decorative advantages, use of channels (wide metal corners) is allowed. In this case, the visible part of the girder will be located only on the inside of the bearing wall. At the same time, there should not be any more on its front surface visible traces of the jumper. First of all, you will need the run itself, prepared by one of the above methods (excluding the option of self-pouring a concrete lintel). 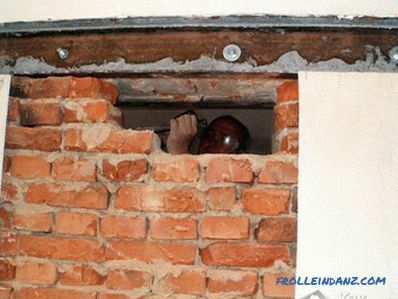 Next, it is necessary to pierce a hole in the brick wall, having previously installed metal support columns under the ceiling. Columns should be driven into the ceiling with a noticeable pressure created by pre-prepared wooden struts. After taking all the necessary precautionary measures, you can begin to form the contours of the future window opening, starting with punching the area under the jumper. This operation should be carried out with great care, carefully monitoring the condition of the surrounding sections of the wall. After the cavity of the required size is formed, it is turned into jumper of the type you have chosen, which is then fixed in the opening with the help of a concrete solution. Immediately after the mortar has dried, the plaster (finishing coating) is removed from the area under the overlap, and then the masonry is disassembled to form a hole for the future window. 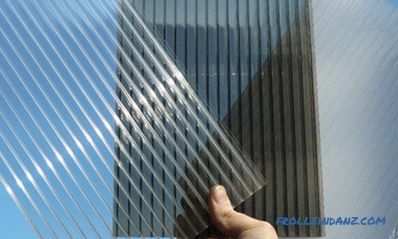 Disassembly should be from top to bottom; at the same time, its lower boundary should be located 10–15 cm below the level required by the window size. At the final stage of the work, the window is simply inserted into the opening.